If you tried to snag an iPhone 4 through Verizon Thursday, before they hit stores on February 10, you had to act fast: Less than 24-hours after Verizon and Apple began taking pre-orders, they halted sales. The exact duration of the sale, which began at the unholy hour of 3 am (EST) on Thursday and was available to pre-existing Verizon subscribers only, reportedly lasted around 17 hours total. Whether or not the companies were forced to stop sales due to actual shortages, or simply to create additional buzz about the iPhone’s imminent Verizon debut, is anyone’s guess, as neither Apple nor Verizon released the exact number of phones they had on hand to meet pre-order sales. Chances are, it’s a combination of both fluff and facts: They’ve only allocated a limited number of phones for pre-order, so that they can sell out quickly, which gets everyone — us included — talking. We do know, however, that Verizon COO John Stratton released an internal company memo to Verizon employees requesting them to not purchase an iPhone 4 for the “time being,” in an effort to “meet our customers’ needs in the midst of what will surely be unprecedented customer demand.” Again, this could all be part of a strategy to churn up some additional last-minute enthusiasm (i.e. sales). Whatever the exact numbers, the iPhone arriving on Verizon is sure to be a boon for both companies. 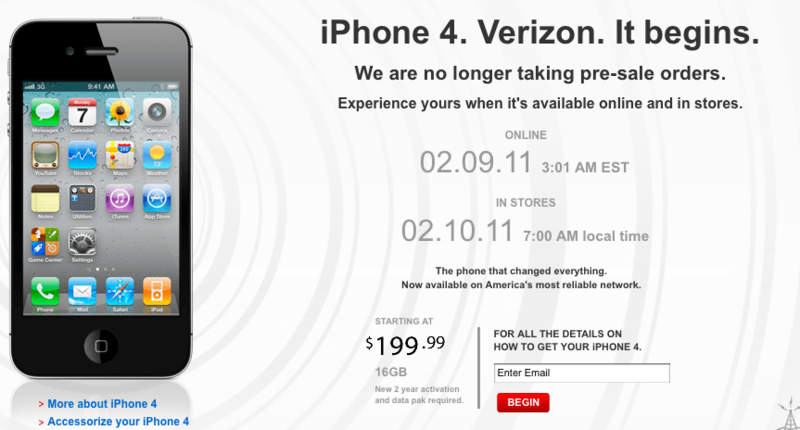 To recap: The Verizon iPhone officially launches on February 10, at 7 am EST, to the general public. (Though some customers will be able to place orders on the Apple Store on Feb. 9.) A 16 GB iPhone 4 will cost $199, or $299 for the 32 GB version, with the signing of a new two-year contract. An “unlimited data plan” through Verizon runs $30 per month. Update: Verizon just announced that, within a mere two hours — between the hours of 3 am and 5 am (EST) on Thursday — iPhone 4 pre-order sales broke the first-day sales record for Verizon, making Thursday “the most successful first day sales in the history of the company.” Perhaps the iPhone 4 shortage is not just talk after all.